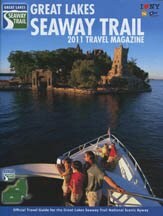 Great Lakes Seaway Trail, NY and PA – Seaway Trail, Inc., based in Sackets Harbor and Webster, NY, has announced the themes for its free 2012 Great Lakes Seaway Trail Travel Magazine. The glossy color publication showcases the diverse tourism resources of the National Scenic Byway that travels 518 miles along the freshwater shoreline of New York and Pennsylvania. • “Experience scenic America” by driving on this National Scenic Byway. There will also be information on the Great Lakes Seaway Trail GeoTrail geocaching adventure and a full set of Great Lakes Seaway Trail VolksWalks (leisure walking opportunities) that will debut Trailwide in 2012. 1 Comment to "Great Lakes Seaway Trail Announces 2012 Travel Themes"